southern end of the South Woods Trail. The Summer 2015 edition of Update the Friends of Pisgah newsletter has been posted. Click here to check it out. 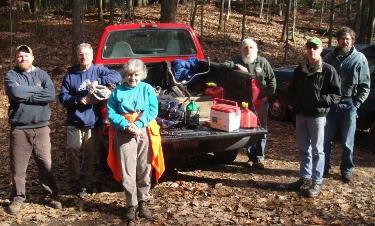 The Monadnock Happy Trails Association (MHTA) work day was a big success! Sharon and Phil Thomsen plus Laura and Art Susmann worked with Park Manager Whip Newell and cleared the Snow Brook trail from Old Spofford Rd to Old Chesterfield Rd. The weather was cool but got warmer as the day progressed. We worked 9 am - 2 pm. Bugs weren't too bad in the beginning but became annoying when the temp increased. Spray was a necessity! Several culverts do need to be replaced; Whip added them to his list. We expected more damage after such a nasty winter but were pleasantly surprised that there were no huge trees down. The Trail is ready for use and MHTA is looking forward to June 6 National Trails Day ride! Abe Howe and son Gabe, Matt Edson and his ATV, John Hudachek and FOP trail chief John Herrick met Pisgah Park Manager Whip Newell at the Horseshoe Trailhead at 10:00am. Although chilly to start it was a perfect working day. Starting at the South Woods trail and continuing up the Habitat trail connecting to Old Chesterfield Road, Lily Pond trail, east end of North Ponds trail, Old Chesterfield Road and what we call the ski trail we removed numerous fallen trees and limbs from the trails. We enjoyed lunch overlooking beautiful Lily Pond. David Weisel, Krister Raasoch with his dogs Art and Harry, Matt Edson, John Hudachek and FOP trail chief John Herrick met Pisgah Park Manager Whip Newell at 10 am on a warm, windy, mostly sunny Saturday at the Kilburn Trailhead in Hinsdale. The business of the day was to spread out over the southern end of the park to look for hemlock trees infested with hemlock woolly adelgid (HWA). We broke into three groups of two. Whip and David drove down to the Route 119 entrance and hiked up to the Reservoir. Matt and John Herrick drove to the south entrance to the Kilburn loop on Route 63 and hiked back the west side of the Kilburn Loop to Kilburn trailhead. Krister and John Hudachek hiked the Davis Hill, Baker Pond, Pisgah Ridge and Kilburn Road trails. We were all back to our vehicles by 2:15 pm. Krister, John Hudachek, Matt Edson and John Herrick found no signs of the woolly adelgid. David and Whip found many trees invested with HWA on the road up to and around the reservoir. Jim Schofield, Abe and Gabe Howe, Jon Knicke rbocker and John Hudachek met Friends of Pisgah Trail Chief John Herrick at 10 am on a mostly sunny Saturday, 12/13/14, at the Kilburn Trailhead in Hinsdale. The first order of business was using hand saws to remove the tree top that had fallen on the top of the kiosk. All lumber supporting the roof is broken, but the roof itself appears to be intact. All limbs fallen across the trail from the trailhead down the west side of the Kilburn loop to past the dam were cut using handsaws and removed. 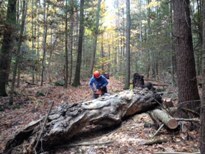 On the way down the trail to the south end of the loop we caught up with Gary Montgomery with his chain saw, Matt Edson and Kim Nilsen. Gary, Matt and Kim had met and started earlier in the morning. We met no other hikers the entire work session. After lunch on the bridge on the south end of the loop Jon and Matt headed south on the trail toward Hinsdale while the rest of the crew headed up the east side of the loop. We were back to our vehicles just before 2:00 pm. The Friends of Pisgah Annual Meeting was held at the Town of Chesterfield Town Hall on Nov 11, 2014. Over 80 members and guests were in attendance. The meeting opened with the introduction of our speaker, Willem Lange, a television personality and outdoor enthusiast and the long serving host of NH Public TV's award winning show "Windows to the Wild." Mr. Lange presented a video of outdoor scenes primarily from northern New England featuring primarily himself hiking and commenting on various aspects of the outdoors. After the video, Mr Lange answered questions with many humorous comments judging by the frequent laughter during his comments. The program was well received. A break was taken for a very fine selection of refreshments and then the business meeting commenced. The following slate of officers for 2015 was presented, nominations closed with no additions and the election was held. All persons nominated were elected. FOP needs a Secretary as the position became vacant just before the Annual Meeting when the current Secretary’s job position changed. A volunteer for Secretary would be appreciated. The Council meets once a month on the first Tuesday at 6:30 pm. Call President Gary Montgomery at 603-363-8420. A very brief discussion followed the election of officers. A comment was made that we are still waiting for the Memorandum of Agreement (MOA) promised almost 3 years ago by the State of NH. Also, Kim Nilsen suggested that we really need to get someone involved who can talk about this neck of the state. Jim Schofield, David Weisel, Krister Raasoch with his dogs Art and Harry, Iva Wood, John Hudachek and FOP trail chief John Herrick met Pisgah Park Manager Whip Newell at the Visitor Center at 10:00am. Although chilly to start it was a perfect working day. We drove down to Fullam Pond where we cleared brush and limbs to open the view of the pond. Using John Herrick's tractor and chipper all the branches were ground into wood chips. This also opens the shoreline for fishing. We finished shortly after 2:00pm and were back at the Visitor Center before 2:30. The Fall 2014 Update newsletter has been posted. Manager Whip Newell worked on the Snow Brook Trail and Orchard Trail. cool; we did get sprinkled on for a minute or two but nothing serious.